Villeroy & Boch (Mettlach, Saarland, Germany, established 1836), designed by Christian Warth (German, active 1854–1892). “1395” Stein, 1885. Stoneware with colored slip and glaze decoration, gilding and pewter. Milwaukee Art Museum, Bequest of Dorothy Trommel in memory of her parents, Eunice and Howard Wertenberg M2013.43. Photo credit: John Glembin. 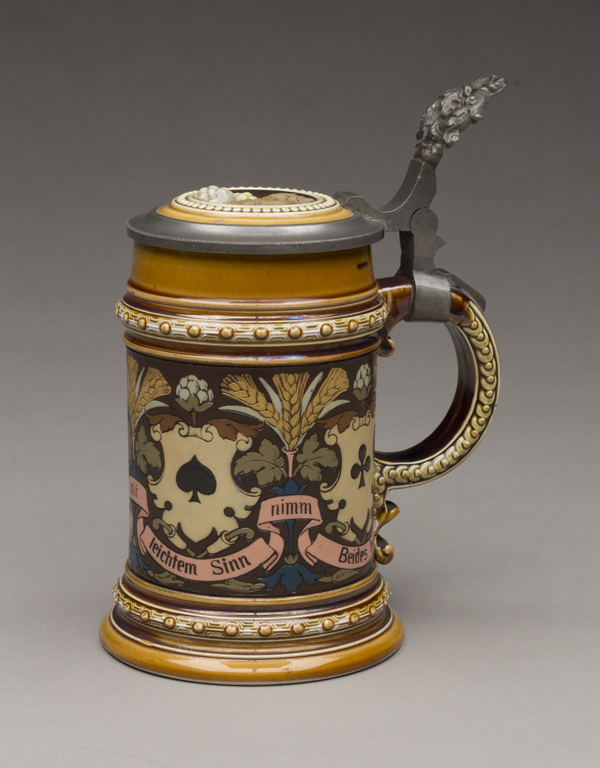 Over the past year, we’ve taken a look at some of the German drinking vessels in the Milwaukee Art Museum’s collection. The subjects have ranged from luxurious silver tankards to early stoneware vessels, and from high-quality Meissen porcelain to the prized tin-glazed earthenware that was developed to mimic it. Now we’ve come to the end of the 19th century, the time of the most dramatic changes for the German drinking vessels. This was due to a powerful combination of events. The first was the formation of the German Empire in 1871 under Wilhelm I, King of Prussia. For the first time, many of the nations that identified with a German culture became part of one nation, and they needed to figure out what that meant. The second is the onset of the industrial revolution. Germany experienced major social changes in a relatively short amount of time. Factories were built and drew huge numbers of people from the country to cities, creating great economic inequality and crowded urban areas. However, the transition from a mainly agrarian country to an industrialized nation did offer the possibility of economic prosperity. The rise of a middle class that had more money to spend meant a demand for more goods. And technological advances also meant that objects such as steins could be produced faster and less expensively. Although the availability of hard liquor to the working poor was considered by many to be a problem—in the worst case scenario, the factory man drinks the income needed to support his family—the local tavern or club was also a way for men to pass the time pleasantly with others who had the same political beliefs or social background. This was especially important in cities, where men were thrown into a large group as strangers. After all, alcohol is a great social lubricant! Eduard von Grützner (German, 1846–1925). 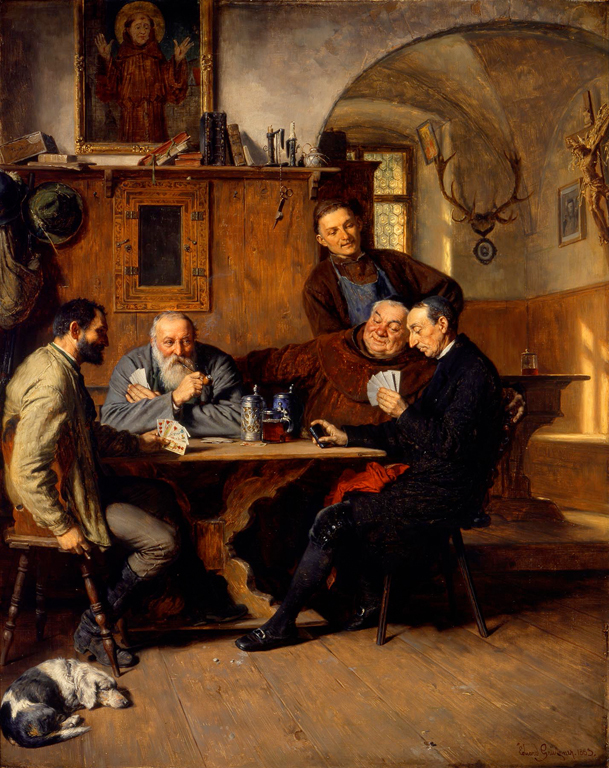 The Card Players, 1883. Oil on canvas. Milwaukee Art Museum, Gift of René von Schleinitz M1967.67. Photo credit: Larry Sanders. Although pub owners would supply their customers with steins of glass or pewter, they would also store a customer’s personal steins on a shelf. Steins became a modest luxury that would show your prosperity and social affiliations. 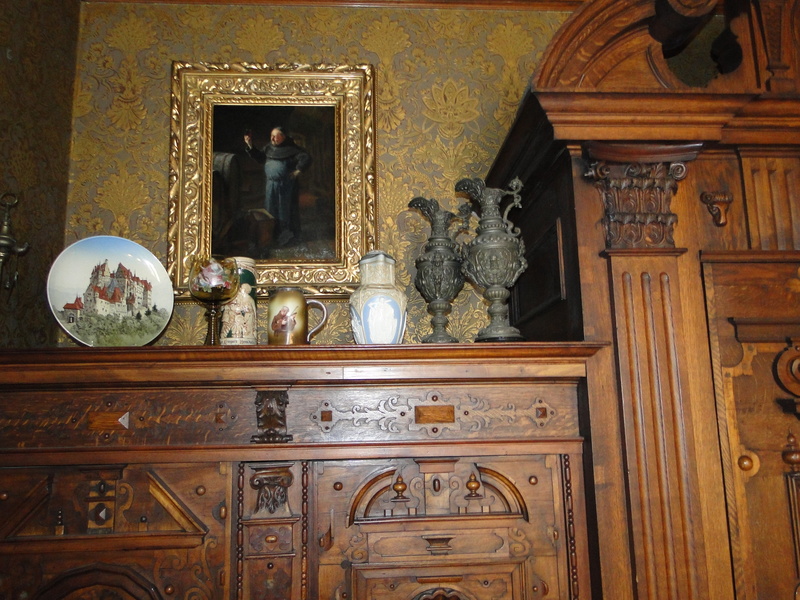 Mettlach and other German decorative arts on top of cabinets in Captain Pabst’s study. Photo courtesy of Pabst Mansion. Another customer for steins are the immigrants in America who were keen to celebrate their roots. In Milwaukee, we have a great example at the Pabst Mansion, built in 1890 by a German immigrant, where drinking vessels are proudly on display. In the historic house, now open as a museum, an assortment of late 19th century wares made in Germany can been seen on the cabinets in Captain Pabst’s study. Although men were almost exclusively the tavern customer, the development of the beer garden and beer hall meant that beer drinking became an important part of family leisure time. Drink was a part of German gatherings, whether it was at a social club, a meeting of a professional guild, or a Sunday afternoon at home. In Milwaukee, Schlitz’s Palm Garden and Pabst’s Park promoted local breweries while offering a space for all people to enjoy. It is this combination of good-will, drink, and food that leads to the appreciation of Gemütlichkeit–a warm, cheerful space–within German communities. All of these factors resulted in an increased demand for drinking vessels. The ability to mass produce them resulted in an explosion in the number of producers to make ceramics and the variety of wares available on the market. As you might expect, then, the majority of the Milwaukee Art Museum’s drinking vessels were made in the late nineteenth and early twentieth century. The collection includes examples of pottery, stoneware, and porcelain steins from a number of factories, such as C. G. Schierholz & Söhn; Ernst Bohne Söhne; and Hauber & Reuther. But the vast majority of the holdings in this area were made by the Villeroy & Boch Company. Villeroy & Boch had factories in a number of locations, but it is the one in Mettlach, in southwestern Germany on the Saar River, that became a gold standard for steins. (You can see an example at the top of this post.) The high-quality stoneware, called Mettlach after the town, was collectible in its own time. 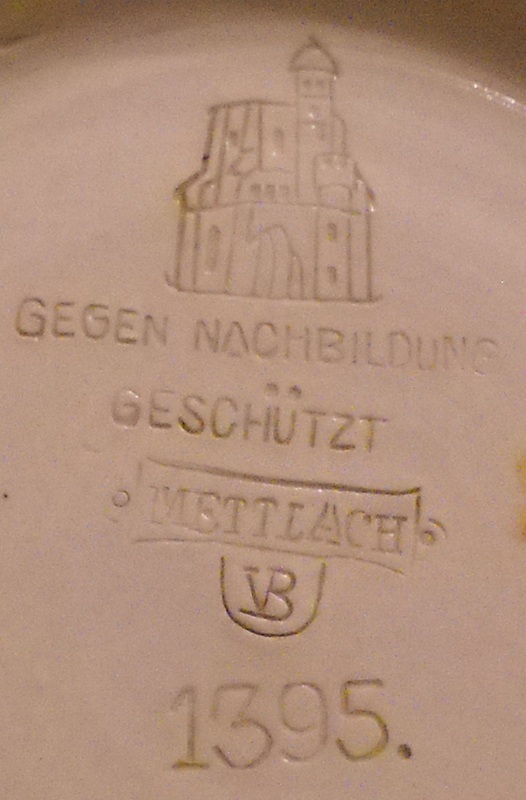 Marks on the bottom of a Mettlach stein. Villeroy & Boch (Mettlach, Saarland, Germany, established 1836), designed by Christian Warth (German, active 1854–1892). “1395” Stein, 1885. Stoneware with colored slip and glaze decoration, gilding and pewter. Milwaukee Art Museum, Bequest of Dorothy Trommel in memory of her parents, Eunice and Howard Wertenberg M2013.43. Photo credit: the author. The factory was housed in a Benedictine Abbey with roots dating back to the middle ages. The Abbey became a trademark of sorts for the company’s stoneware, and an outline of the Abbey’s medieval chapel was used in the factory’s marks for many years. Villeroy & Boch kept their process a closely guarded secret, and after company records were destroyed in the 1920’s, the particulars were completely lost. The fascinating detail and beautiful colors of their wares not only made them a commercial success, but also won them critical acclaim at public exhibitions, including awards at the World’s Fair in Chicago in 1893. Although best known today for their seemingly unlimited number of stein and pitcher designs, Mettlach stoneware was also available in decorative plaques, vases, and pokals. Each work was listed in the company catalogues by a number that was also marked on the base; it is these numbers that are used as the title. Next time we’ll take a closer look at some Mettlach steins—stay tuned!